Today I celebrated my 23rd Mother’s Day as a mother… and my 23rd Mother’s Day without mine. It still makes me sad that we never celebrated a Mother’s Day together as mothers. That’s not to say that she didn’t do her best to instill in me the best of herself while she was here and while I have missed my Mom more than I can say, in so many ways, I feel my Mother’s presence all the time. If I have been thoughtful, generous, or kind in my life, I would give my Mother the credit for showing me the way. She molded me into the person I have become: A woman who would do almost anything for her children, her friends or strangers in need; a woman with a conscience, who does the right thing because it’s the right thing to do; a woman who gave away a pie every day for a year because she was grateful to have been so loved and so blessed in her own life. Each day, I live my life with as much grace and love as I can muster, because to do so honors my Mother. Recently, my friend Ann Marie told me about a woman named Helen who has been like a Mother to her for more than twenty years. Helen Smith was born in Peru, Nebraska and grew up in her family home that also served as a boarding house. Since Peru is a college town there is some speculation that there were some pretty smart boarders in the house and that perhaps they inspired Helen’s lifelong love of learning. In her later years, Helen became known as Grandma Helen, and spent many hours volunteering in the classroom of one of her other “adopted” daughters. A week or so ago, Helen celebrated her 100th birthday. This event was commemorated with a bench that was placed in Lithia Park in her honor. This was a lovely tribute but I have a feeling that Helen is honored many times each day. Every time one of the students she helped succeeds, or reaches out to help someone else, or inspires someone to learn, Helen is honored. And I think that is the very best tribute of all. 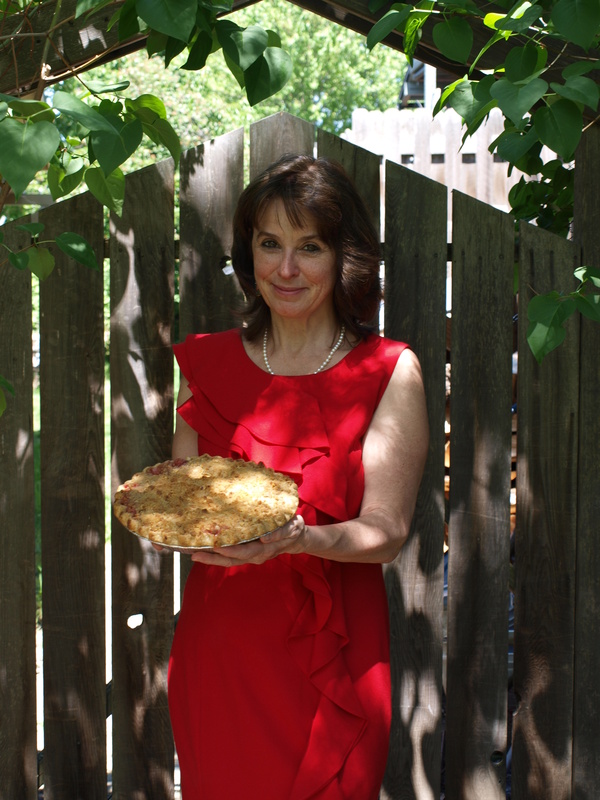 This morning I baked a Strawberry Rhubarb Pie (the first of the year!) for Helen. I want to thank her for sharing her heart with so many. Thank you Michela… as did yours! What a wonderful photo of you! Happy Mothers Day. Great post and nice tribute to your mamma! That was the sweetest post! What a lovely gift on Mother’s Day! Your Mama would be proud! Thank you and Happy Mother’s Day to you as well! Thank you Teddi! I really do hope that she is… see you soon! Karen, This is a beautiful thing you are doing. You are also very beautiful in your red dress with pie. Thank you so much for bring Helen, the resident in my care home, your pie. What an honor. The lovely thing is that she will appreciate it with full heart.